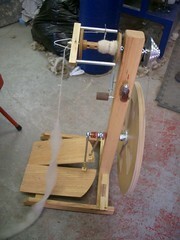 There she is, still at the spinnery. I’m going to need help finding a name for her. Fricke is a name difficult to alter in a pretty way so I’ll take all the help I can get! Maybe I’ll even turn that into a contest… The best name wins something cool and fibery? I bought my wheel from Twist of Fate Spinnery . 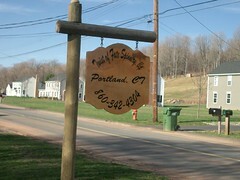 They are located in Portland Connecticut. These are the two owners of the small company. The guy on the right just didn’t want his picture taken… Was afraid that his picture might end up on some blog or something! Lol! I did confirm to him that the picture would, indeed, end up on my blog. 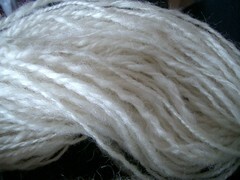 I didn’t get a chance that first evening to spin on the wheel, but the next day I dug into the 8oz Romney that they gave me and started spinning away. You can see the results of my first few bobbins here and here. Here I am showing off my 3rd and 4th bobbins all plied up together. You can click on the pictures to see them bigger. I’ve spun up two more bobbins to practice plying some more. Also I ordered the book “Teach Yourself VISUALLY Handspinning”. Since I am teaching myself how to spin, I hope that this book will be a great help. 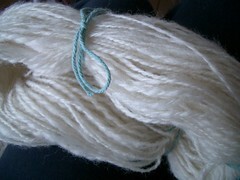 I’ve also ordered some Corriedale pencil roving from Crown Mountain Farm for when I’m a bit better. Also, I still need to buy a niddy noddy (I used a hanger to skein the yarn you see above). I’ve really been enjoying my spinning time so far. It hurts my back though, so if you have suggestions as to how I should be sitting or what kind of chair I should be using I will gladly hear them.